Our Brewery | Hop City Brewing Co. Behind a parking lot, in an industrial warehouse, you`ll find our craft brewery. In 2009, Kevin and John entered the building. One top secret recipe book, seven fermenters, and a dozen Barking Squirrels later, Hop City Brewing Co. was born. Meet Kevin. Kevin applied for his first brewing gig in September ’91, after his mother deliberately told him not to. Following a decade at Niagara Falls Brewing Co., Kevin found his home at Hop City. 26 years of brewing later, Kevin still loves the satisfaction of the brewing journey – that at the end of the day, you have a tangible product, something delicious to show for your work. Kevin’s brew of choice? 8th Sin Black Lager. Meet John. John home brewed his first batch of beer at 19, non-coincidentally the same age he was legally allowed to drink it. In the 90’s he opened up a home brew supply store before landing a job as a brewer. 33 years of brewing later, he’s still home brewing, and even grows hops in his backyard. 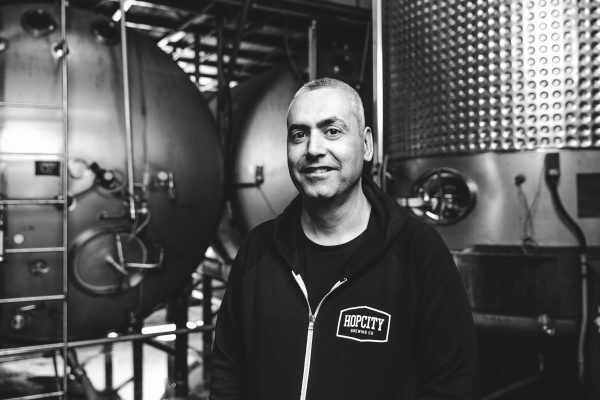 John’s favourite part of brewing is the experimentation – “we’re like liquid chefs”. John’s brew of choice? Barking Squirrel Lager. We Make Beer. Check it out.